The GO Foundation is expanding to South Australia with a new scholarship program established at the University of South Australia (UniSA). Swans Chairman and UniSA graduate, Andrew Pridham, recently presented a $5 million cheque to the university to go towards its new great hall, now under construction in Hindley Street in Adelaide’s CBD. The signature building, which will now be known as Pridham Hall, will house multipurpose sports and graduation venues. Pridham’s philanthropic gift is being further recognised by the South Australian State Government, which will augment the donation with an additional $1 million to create two new perpetual scholarship programs. 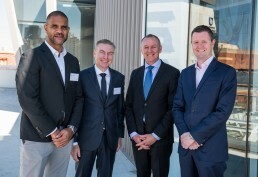 The Goodes O’Loughlin UniSA GO Scholarship will recognise outstanding academic merit by high-achieving Aboriginal and Torres Strait Islander students seeking to study at the university and expand the work of the GO Foundation. The second Elite Athlete Scholarship will support high-achieving sportspeople to attain their university education at UniSA. Co-founder of the GO Foundation Michael O’Loughlin says it’s a fantastic result for GO. “Having worked with and known Andrew Pridham for many years I am really proud to see how his personal generosity will make a difference in my home state of South Australia,” O’Loughlin said. “We are very grateful to the State Government for taking this opportunity to launch important scholarships that will advance the educational and sporting opportunities for not only Aboriginal and Torres Strait Islander students, but all students who want to pursue their dreams but that might be otherwise held back by lack of funds.